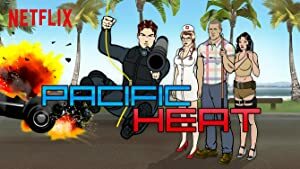 Pacific Heat – Season 1 (2016) – What's New on Netflix Canada Today! In this animated satire, a covert squad of operatives short on smarts but long on confidence tackles crime on the glitzy Gold Coast of Australia. The law of averages suggests that the more jokes a comedy makes, the fewer laughs each individual goof will get. Netflix’s new Australian import Pacific Heat manages to apply a sort of comedic theory of relativity to that premise, delivering what feels like an infinite number of gags in its interminable 22-minute run time, and somehow managing to not let a single one of them be good. The animated series—originally broadcast on Australia’s The Comedy Channel—centers on an undercover police unit operating on Australia’s Gold Coast, tasked with stopping drug dealers, international terrorists, and other paint-by-number espionage plots.